Well, today I have been thinking about the numerous problems with Copernican heliocentrism and all of the apologists for it and I decided to give NASA "the benefit of the doubt" and ask if they have even heard of such glaring problems with their endorsed model (which would naturally have come in handy during all of their expensive, seemingly critical space missions). To my mind, the best place to educate NASA on the problems with their Copernican-Keplerian-Newtonian heliocentric mode would be the new TYCHOS.info web site, which offers many places to begin their revisions and generously offers a replacement solar system model for them to begin studying. However, NASA specifically asks not to receive links in messages sent to them. So I have written and sent them this (with their rather conservative 250 character limit). To me, they certainly made it look as though I have successfully sent them my message. Now, I suppose we just have to wait 10 to 15 business days for the message to be "processed". I eagerly await a response! Great idea Hoi. Will do the same to some official "space" agencies in Sweden and report any responses. Even if many of them turn out to be compromised or obtuse or even dead silent, naturally some of these will have level-minded people that will see this as, at the very least, intellectual stimulation. This model badly needs to be put to the test by some expert astronomers. Without astronomers endorsing it I don't see how it could make it to the mainstream. I don't mean sending a link with a brief summary, but rather sending the whole book, possibly even in print where the costs are not too high. Or is this being done already? nonhocapito wrote: Or is this being done already? Yes, Nonho - I'm taking care of this these days and will continue to do so for ... as long as I live, I guess ! I am well familiar with that Wiki page you linked to - and am currently compiling a gigantic list of relevant, 'targeted' recipients. Alright, so I'm not gonna send my book for free to all of those contacts - only to selected ones. I need to eat & pay my house bills, for Heaven's sakes! As it is, one of the first persons I sent the Tychos PDF book to was Piero Benvenuti, the current general secretary of the IAU (International Astronomical Union). I did so ten days before he was scheduled to speak at an astronomy symposium held here in my small town where I live, Frascati (on March 21 - the day of release of the Tychos, as it were !)... So I naturally asked him (in my e-mail) if he would kindly read the book - and to concede me ten minutes or so after the conference for a brief private conversation. ho scorso rapidamente i suoi scritti e devo dirle con tutta franchezza che le sue conclusioni sono in totale contrasto con i dati sperimentali, in particolare con le misure di parallasse e dei moti propri delle stelle della nostra Galassia. I satelliti Hipparcos e Gaia ci hanno fornito misure astrometriche con la precisione di 0.00001 secondi d'arco, permettendoci di determinare la distanza di milliardi di stelle fino a 30.000 anni luce grazie alla misura della loro parallasse annua, che lei afferma non essere stata misurata neppure per la stella Polare. Le consiglio di consultare, per esempio, il sito ESA dedicato alla missione GAIA e di rivedere le sue affermazioni ( http://sci.esa.int/gaia/ ). La scienza avanza unicamente sulla base di osservazioni sperimentali e teorie o modelli che contrastino con i dati osservativi non possono essere considerati scientifici. P.S. : Subito dopo la Conferenza devo spostarmi a Roma per un impegno. I have rapidly browsed your writings and have to tell you quite frankly that your conclusions are in total contrast with the experimental data,in particular with the parallax measurements and the proper motions of our Galaxy. The Hipparcos and Gaia satellites have provided us with astrometric measurements with a precision of 0.00001 seconds of arc, allowing us to determine the distance of billions of stars up to 30,000 light years thanks to the measurement of their annual parallax, which you claim not to have even been measured for the Pole star. I advise you to consult, for instance, the ESA website dedicated to the Gaia mission and to review your claims. PS: Immediately after the Conference I have to travel to Rome for a commitment. "Well, the latest (2012) estimation of the Earth-to-Polaris distance (“323 light years”) is a whopping 34% shorter than the former estimate of “433 light years” (as listed in official ESA and NASA star catalogs)." "And remember that the International Astronomical Union is very, very keen in supporting all these efforts. So, if you need help, do not hesitate to contact us". Well I did contact Prof. Benvenuti directly - but it seems that my 5-year-long efforts didn't even warrant ten minutes of his attention. Thank you for your inquiry to NASA. Apologies are extended for the delay in responding, as NASA receives thousands of inquiries each week from all across the United States and around the world. You are also encouraged to visit http://www.nasa.gov for the latest NASA news and information. In addition, NASA invites you to consider using one or more of the following easy and convenient communications tools for receiving NASA Updates on the exciting work NASA is doing. • Subscribe to E-mail Delivery – Simply go to http://www.nasa.gov, enter your e-mail address, set your delivery preferences, and choose your area(s) of interest. Your interest in NASA is greatly appreciated. Curiously, while many of the links sent include information about planetary bodies, none of them has a solar system model. Or if there is one, it's buried quite a few links deep as I wasn't able to find a detailed explanation of the solar system. Have the Snøhetta Architects been informed they may need to make a few adjustments to their planetarium? 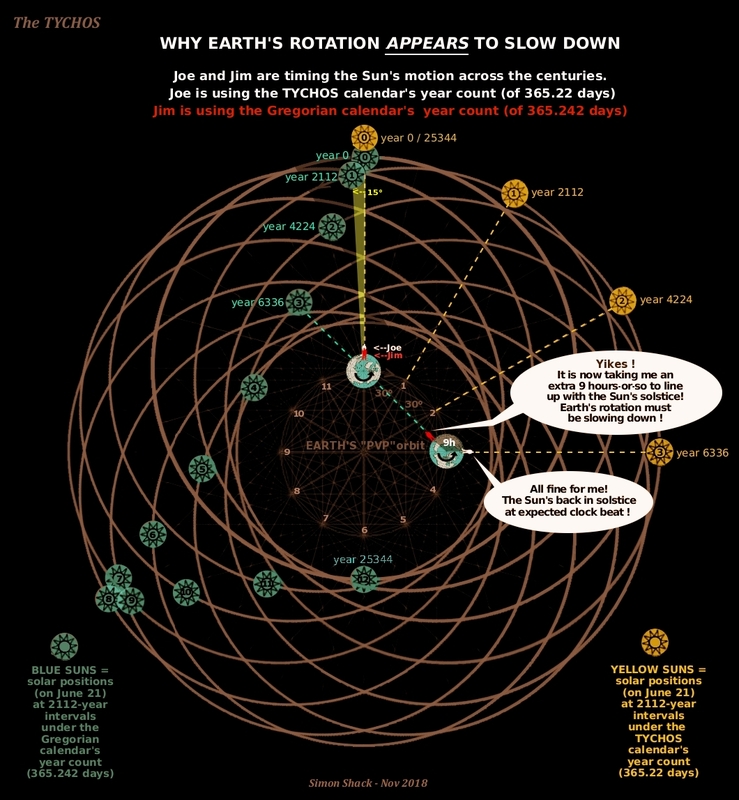 "Earth's rotation is slowing slightly with time; thus, a day was shorter in the past. This is due to the tidal effects the Moon has on Earth's rotation. Atomic clocks show that a modern day is longer by about 1.7 milliseconds than a century ago, slowly increasing the rate at which UTC [the Coordinated Universal Time] is adjusted by leap seconds." Huh? Tidal effects? "A modern DAY is about 1.7 milliseconds longer than a century ago"? And this rate of deceleration is apparently increasing? Well, these would seem like rather worrisome statements which, if true, would have ghastly implications for our planet. Now, 1.7ms-per-century might seem like a mere trifle - but this would mean that Earth's daily rotation would slow down by several hours in only a few millennia (not millions of years). Of course, the apocaliptic, long-term prospect would be that Earth would eventually stop rotating altogether! This is, in my honest opinion (backed by my TYCHOS research), patently absurd - since NO celestial bodies have EVER been observed (nor even hypothesized) to stop rotating around their axes. For the purpose of expounding this crucial matter I have used (in my below graphic) a 6336-year (or 63.36-century) timespan - i.e. 1/4th of a TYCHOS Great Year (or "Annus Magnus") of 25344 years - i.e. the time employed by Earth to revolve once around its PVP orbit. This, in order to illustrate what is expected to happen over a 6336-year period - according to the TYCHOS model. 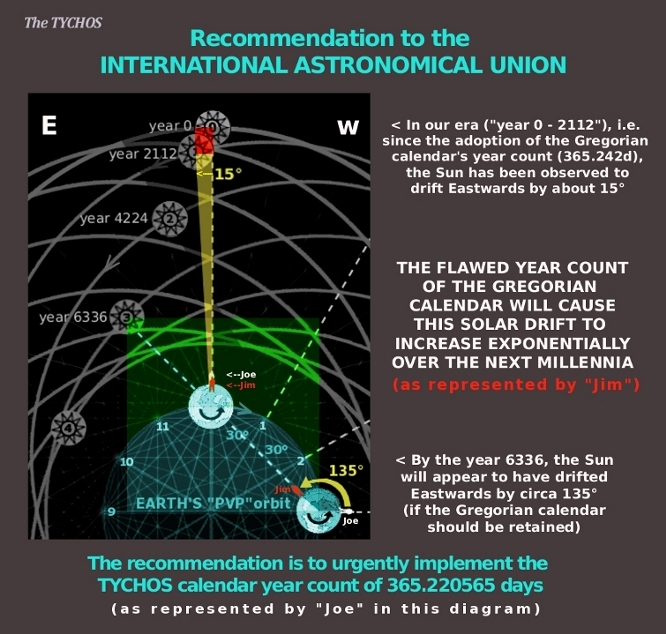 As I've shown in my TYCHOS book, in 2112 years the Sun is drifting Eastwards by about 15° (in our current era) according to the Gregorian calendar - but this "Gregorian drift" is destined to increase EXPONENTIALLY. Since the reason for this apparent deceleration of Earth's rotation is completely misunderstood, the IAU folks keep "containing the problem" by adding, from time to time, a leap second to their "Atomic Time". This, in order to artificially nudge Earth's rotation rate so as to make it catch up with our clocks which, of course, are being (erratically) "adjusted to agree" with our current Gregorian calendar count - and the UTC. 6336y / 45 = 140.8 X 27s = 3801.6seconds / or... 63.36 minutes! In other words, they are currently adding EXACTLY 1 "leap MINUTE"-per-century - for whatever unfathomable reason (since it's not mentioned / nor explained anywhere - as far as I can tell). Yet, it is a curious and fairly interesting factoid. Anyhow, this 1-minute-per-century insertion will certainly not be nearly enough to compensate for the Sun's expected EXPONENTIAL Eastward drift over longer periods of time (IF the faulty Gregorian calendar's year count should be retained) - as illustrated in my above diagram. It is rather comical to read the many controversies surrounding the "leap second" insertions - on the part of the IAU. Incredibly enough, no consensus has yet been reached (in spite of decades of discussions) among the various international agencies regulating / or depending on the correct time-keeping of our Sun's motions. To exemplify (for brevity) the utter confusion reigning in this field of science, I have chosen a short PDF report published by the ITU (International Telecommunication Union) based in Geneva, Switzerland (the Land of Clockmakers!). The report explicitly laments the IAU's failure to reach any sort of agreement regarding the implementation of "leap second" adjustments (or, as some institutions are now strongly recommending, the complete elimination of the same!) - so as to finally define the correct calibration of the UTC (Coordinated Universal Time). "Discussions on the future UTC in the International Astronomical Union"
As you may well imagine, this is nothing less than a monumental issue which concerns humanity as a whole: if we cannot even agree about how to calibrate our clocks in relation to the Sun's secular motions, we can hardly keep claiming that we are a scientifically-advanced species. Hence, in order to prevent humanity becoming the laughing stock of this universe (who knows, perhaps Martians or other remote civilizations will pay us a visit one day in the future? ), I will henceforth humbly submit my personal recommendations to the IAU. As it happens, I personally met the current president of the IAU, Piero Benvenuti on March 21, 2018 (incidentally - or serendipitiously - the same day that I released my TYCHOS research!) - although he only allowed me a scant few "leap seconds" of his time (the account of this brief meeting can be found here). Failing to implement this recommendation will, in my honest opinion, be detrimental to all Earthlings. I expect this recommendation to be ignored (for "as long as possible") - but future generations may be able to say that "Simon said so". At top left of the screen, you can switch between "TYCHOS OPTIMAL" mode and "GREGORIAN" mode - to see the difference between my proposed, ideal year count of 365.220565 days - versus the current Gregorian year count of 365.24219 days. This thread could just as well be titled, more generally, "Diffusing the TYCHOS model". Therefore, let me share here on this thread - and from now on - the various "problematics" that we encounter along the way, since I'm getting the feeling that it will turn out to be a most interesting "case study" as to the difficulties of diffusing & sharing a new and (literally) "revolutionary" discovery with this world's scientific community. I will hasten to say that I never thought this would be an easy enterprise - and am fully aware that diffusing the TYCHOS will be the Mother of uphill battles. Fortunately - and as you may know - I've grown rather "thick-skinned" over the years and have learned to take slammed doors and vapid dismissals with good humor. It is no exaggeration to say that modern-day science has become a cult-like, dogmatic religion - that is, for most people involved in this peculiar field of human endeavor (or "endeavour", if you're on my side of the pond). Now, you should know that, at this moment in time, we are only three individuals (Patrik, Martin and yours truly - all of us from Sweden) who dedicate time and efforts diffusing the TYCHOS model - only with our blood sweat & tears, you could say, and on a near-zero budget (other than our own personal savings - which are very modest). Of course, I feel the need to specify such things - because rumors are already circulating as to what some critical thinkers may perceive as a "fishy & suspicious disinfo operation financed by the Powers That Be". It is not. Mind you, I don't blame them - given the truckloads of crap science and manufactured deceptions that the mainstream media AND internet exposes us to, on a daily basis. On top of that truckload is, of course, the NASA-funded "Flat Earth" disinfo operation which we have all seen unfolding in front of our very eyes in later years. If you are not an astronomer, please know that the Tychosium 2D is currently the most accurate simulation ever devised of our so-called "inner" solar system - since it matches to a high level of precision the various motions / positions (as observed since ancient times) of the Sun, Mars, Venus, Mercury, Earth and our Moon. The equivalent Copernican planetariums, on the other hand, are afflicted by insuperable geometric problems - as illustrated and expounded in my book, "THE TYCHOS". My book may be a somewhat demanding read, but I firmly believe that it is the most "user-friendly" astronomy treatise EVER conceived - what with its many visual, explicative illustrations: it's a book which KIDS will love to read (and I have already received confirmation of this!). But I digress (since this post of mine is about "Diffusing the TYCHOS"). 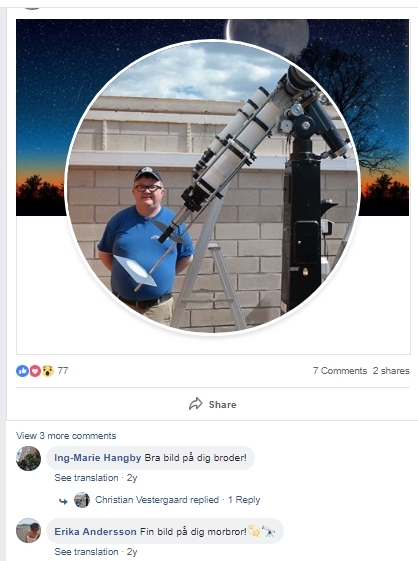 For the last ten days or so, we had an ongoing Facebook discussion at the FB page of the GOTEBORG ASTRONOMICAL CLUB. This, because we (Patrik, Martin and I) are planning to present the TYCHOS at a conference in Gothenburg (Sweden) sometime in February next year. Many questions were asked about the TYCHOS - and I did my very best to respond to them all. 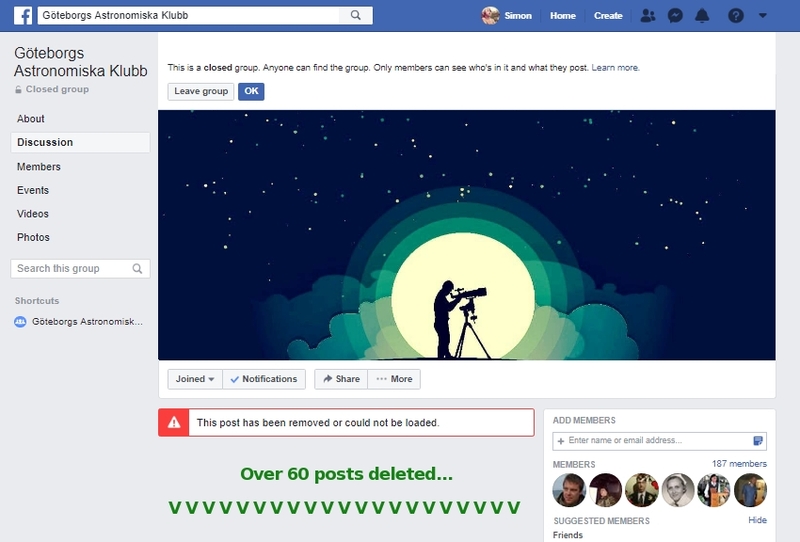 Well, to make a long story short, today the administrator of that FB group simply deleted the ENTIRE DISCUSSION (totalling more than 60 posts) ! For the last ten days or so, we had an ongoing Facebook discussion at the FB page of the GOTEBORG ASTRONOMICAL CLUB. This, because we (Patrik, Martin and I) are planning to present the TYCHOS at a conference in Gothenburg (Sweden) sometime in February next year. Many questions were asked about the TYCHOS - and I did my very best to respond to them all. Well, to make a long story short, today the administrator of that FB group simply deleted the ENTIRE DISCUSSION (totalling more than 60 posts) ! Well, if that’s not downright alarming, I don’t quite know what to say! I suppose you (and we) may reasonably infer that said posts dinged the nerve centers of “propaganda maintenance” such that they felt compelled to do such a thing. A hard “earned” invisible badge of honor for you my dear friend. "Äntligen fick jag fångat denna satellit på bild, filmhastiget 68fps, kamera Zwo asi 178 (gain 185)"
"I finally captured this satellite on film, film speed 68fps, camera Zwo asi 178 (gain 185)"